Do You Realize You Could Be Losing An Amazing 80% Of Your Sales, and Opt-In Subscribers Because Of ISP and Toolbar Popup Blockers? Are Your Popup Windows Being Blocked?.. "What If There Was A Way To Avoid Popup Blockers, Start Generating More Income, and Increase Your Email Opt-In Lists That's Simple and Easy?.." FACT: Popups today are blocked 80% of the time by popup blockers. FACT: Internet Service Providers are taking action against popups. FACT: If your popups are being blocked, you're losing a vital stream of revenue. FACT: Popups can help you increase your sales. FACT: Popups can help you increase your opt-in subscribers. Are you one of the many site owners, and marketers on the Internet that is still using the old style popups that almost every toolbar can block today? This could have devastating effects on you as a legitimate online business person. The fact that your popups are being blocked means you could be missing out on hundreds, if not thousands of dollars in sales, as well as losing opt-in subscribers to your email lists. It's been proven many times over that popups improve your opt-in subscribers, and that can mean thousands of dollars in revenue for you for years to come. Popups are an incredible way to inform your potential customers, and returning clients of your special limited time offers, that they would miss out on otherwise. Take Back Control Of Your Online Business! Using our Brand New "PopUp Machine" gives you back the control you once had over your online business. Your popups become an integral part of the HTML code on your web page, and can even help in adding more content for search engine spiders to find, and help rank your website. You can add the popup code anywhere you like from the top to bottom of your page, the choice is yours. In fact, if you already have your web page optimized for the search engines, you can add your popup window code to an external file, and access it without harming your optimized page. When you take back control of your website, you are taking back control over your financial income that your online business could be producing for you. As an online business person, you know just how important it is to have an email opt-in list, right? How many potential subscribers are you missing out on each month by having your popups blocked?... One, Ten, 100 or more? How many potential sales are you losing because a popup blocker kills your once in a lifetime special offer that your customers would love to have? It's time to take back control over your offers, and email opt-in lists, and start reaping the benefits of the time and effort you've put into your business. More Flexibility With The Pop Up Machine! We created the "Pop Up Machine" with flexibility in mind. You have control over size, border colours, background colours, text size and face, table layout design, popup timing, and more. You can create your own table layout and designs, or simply copy/paste ones we have created for you. 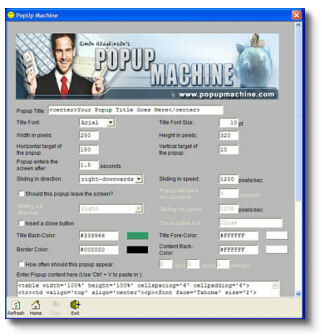 You can also have your popups exit your page without any input from your website visitors at all. We provide you with a very simple to read and understand users manual that can have you up and running in a matter of minutes. MUST ACT NOW BONUS! Order Today And You'll Receive At No Extra Cost - The Master Resell Rights!!! DON'T MISS THIS INCREDIBLE BONUS! Grab Your Copy Of POP UP MACHINE Right Now!